it was a movie that was part of my up comingness of young adulthood. in my high school days, i pondered more the lyrics of paul simon than the cinematic genius of mike nichols. i liked ann bancroft since she was wrestling with patty duke in the miracle worker years earlier. not sure what was in my nine-year-old mind then, but…. 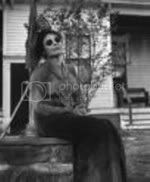 ann bancroft in dark glasses and victorian garb., yowza! confusion which was beginning to germinate in my own yard, so to speak. got off the bus? now that’s a movie that cries out for a sequel. him a job with his east coast partner. ben’s natural manipulative ability runs him up the business ladder quickly. plato’s retreat at the ansonia hotel. there’s warhol and watergate. she’s all hopped up on the cocaine. she remarries, becomes a legal aid activist and remains in new york. he’s last seen boarding a plane. to the tune “old friends” by simon and garfunkle. they meet at services for mrs. robinson. remained such until four years ago when he received a letter from mrs.
robinson asking if he could please come and see her. fortune over the years and it was all willed to him. well. most of it, anyway. GENIUS! like annie hall meets requiem for a dream. a buddy film/cautionary tale. How about a Kevin Spacey/Annette Bening pairing? Miss you, Steve. Hope you’re doing well.